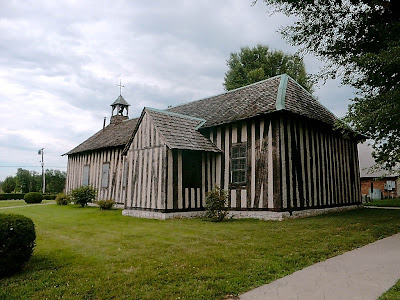 The Latin Liturgy Association convention toured a number of local churches last Friday, including the old Holy Family log church, in Cahokia, Illinois, located about five highway miles south of downtown Saint Louis, Missouri. It is in the Diocese of Belleville. 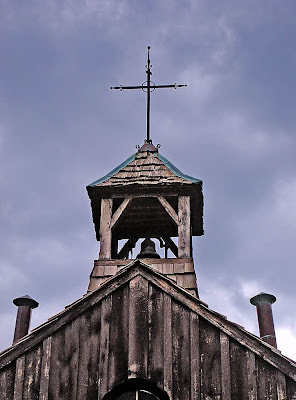 This church was built in 1799, in the French colonial poteaux-sur-solle (post-on-sill) vertical-log construction method; it replaced a church built 100 years earlier and is similar in construction to numerous other surviving colonial buildings of the period. The vertical timbers lean inward, strengthening the structure. The vertical timbers are walnut, the roof frame is oak, and the roof is cypress covered by sycamore. 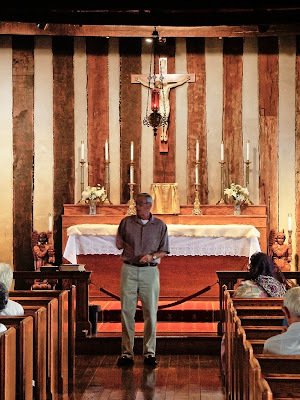 About 80% of the wood in this church is original. 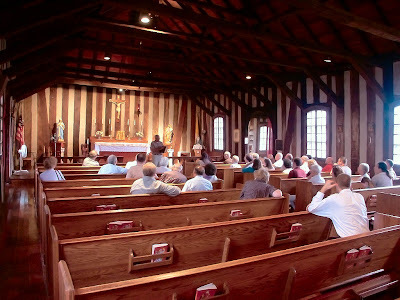 Interior of the church, with LLA members hearing a talk on its history. This is one of the smallest Catholic churches in the region, with a capacity of just over 100 worshipers. 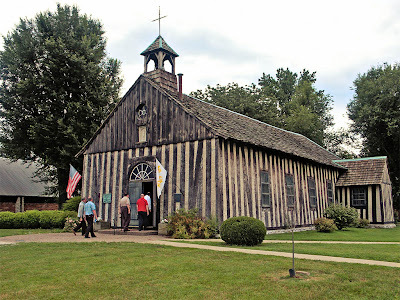 Jesuit missionaries arrived from Canada in 1698, and founded this parish in 1699. Actually, this area was Canada at one time, and directly across the Mississippi River was Louisiana. LLA members listen to the history of the church. 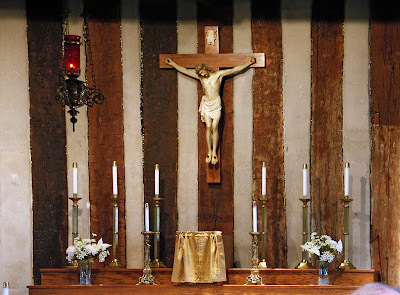 The main altar and tabernacle. 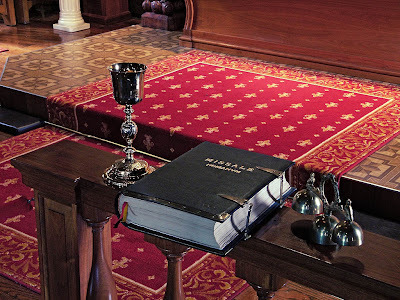 The Indult Latin Mass is offered here at 9:00 a.m. Sundays, and also on Holy Days of Obligation. 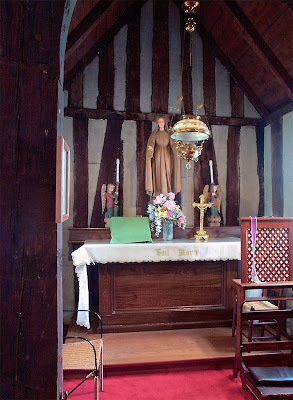 One of the transepts of this tiny church doubles as the confessional and a side-altar in honor of the Virgin Mary. 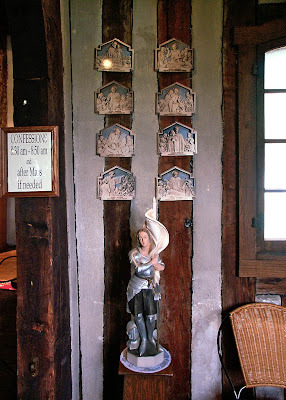 Here is also a series of pottery plaques on the patronage of Saint Joseph, above a statue of Saint Joan of Arc. This chalice was used in 1698 on the Feast of the Immaculate Conception by Father Jean Ste. Cosme at Holy Family's first Mass. Pope John Paul II also used it during the Youth Mass in Saint Louis in 1999. 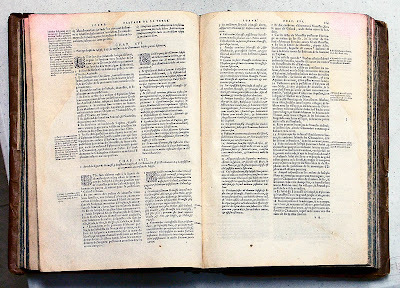 The Missale Romanum is original to the church and was printed in 1668. The church also owns a monstrance from 1717. These items are not kept in the church, but were brought here for the LLA tour. A closer view of the missal, which contains the text of the Mass, along with special readings and prayers for the season and feastday. 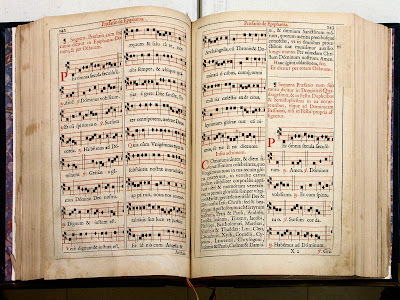 The paper quality and binding of this missal exceed our current standards of bookmaking. A Latin and French Bible, also in excellent condition. 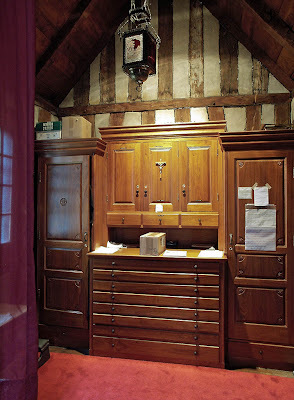 The other transept houses the sacristy. 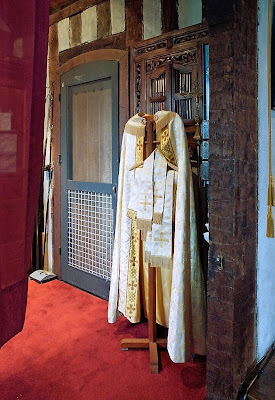 Traditional vestments in the sacristy. 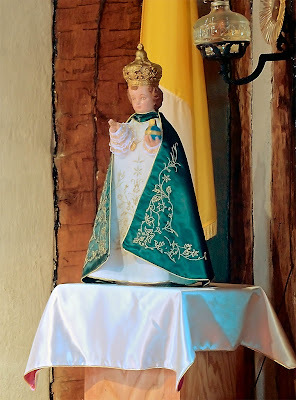 Infant Jesus of Prague, made in the Philippines. 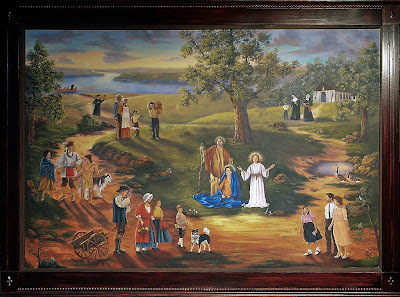 A painting showing the history of the church. A view of the back of the church. Behind this building you can see a part of the new Holy Family church, constructed in 1972. It replaced a Gothic structure built in 1889. 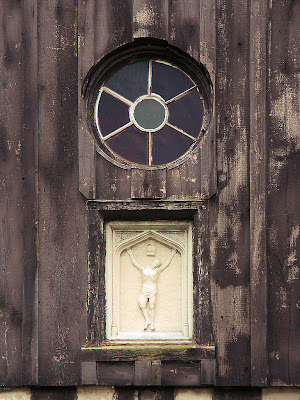 Detail above the front door. 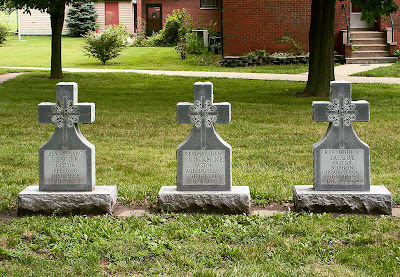 Graves of some early priests of the parish. Thank you for sharing this church with us all! It's one of the most beautiful churches in America; without you, I would never have known it. 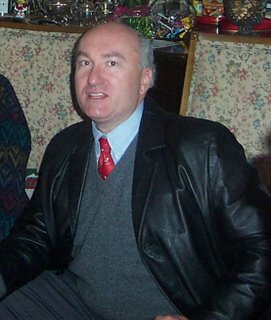 May I assume that you are the same Bill Thayer who has this great website on Roman antiquity and Italian churches? Yes; Italy's got no monopoly on churches; although when you're there, it sometimes seems so! The plaques above the statue of St. Joan of Arc are actually replicas of sculptures from the Oratory of St. Joseph in Montreal. They illustrate the many patronages of St. Joseph. Pere Jean Ste Cosme could not have celebrated the feast of the Immaculate Conception in 1698 since the doctrine was not declared until 1854...he must have celebrated the "Feast of the Conception" as the feast was known in all pre-1854 missals. Pere Jean could not have celebrated the feast of the Immaculate conception in 1698 since the Immaculate Conception was not declared a doctrine of the Church until 1854...hence, using a missal of the 17th century, he would have celebrated "The Feast of the Conception." Eight generations of my family were baptized in this parish, including many in this church. Our surname was spelled Plouffe, being of Alsatian origin, until a German pastor wrote it in the records as he heard it: Pluff. As a child I attended first and second grade at Holy Family. I also was chosen to attend the first mass ceremony for a new priest. I have no idea of his name today. I know I wore a fancy dress, as did three other girls. We sat in front like little angels. I'm not sure why I was chosen, but I did serve at his first mass. I often wonder if there are any photos from that day. I believe it was in 1960 ir 1959. This is a beautiful church and when I do get to St. Louis I try to go see it again. On a bitter December evening, a week before Christmas, Parks College held it's baccalaureate in this church. My brother was graduating, and I'd traveled from Maryland for the occasion. The church was candlelit, and it was a memorable service. It's been over twenty five years, but I can still recall the cold which contributed to the beauty of that little historic church! At one time two other churches in the area were constructed in this manner. They were St. Charles Borromeo in St. Charles and St. Ferdinand in Florissant. Both are long gone though in St. Charles they have constructed something of a replica.